Is the application integration on cloud worrying you? For salesforce.com products to truly add business value to the enterprise, integration is crucial. The increasing shift toward hybrid architectures, moreover, means that integration solutions must be able to seamlessly connect salesforce.com with other SAAS applications and on-premise legacy systems. CirroLogix offers a comprehensive set of services to help enterprises integrate cloud and on-premise applications using both cloud APIs and middleware. To seamlessly integrate and synchronize salesforce CRM with existing enterprise applications, we import and map the data from any of the legacy or on premise systems or use web services. 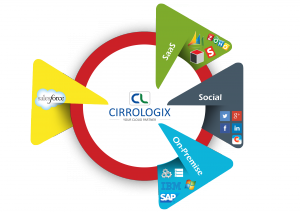 CirroLogix will customize existing modules or develop unique applications that enable a fast and smooth integration of your on-demand salesforce CRM solution with your website and other systems, such as an ERP, Accounting package and any other back-end systems. Businesses often employ two systems to make sure business processes run efficiently – a Client Relationship Management (CRM) system and an Enterprise Resource Planning (ERP) system. SAP, Oracle, Salesforce.com and Microsoft offer on-premise as well as Software as a Service (SaaS) CRM and ERP solutions to businesses of all sizes. Both client relationship management and enterprise resource planning systems independently offer substantial benefits to businesses. Employing a powerful integration system allows connectivity between the two, providing more advantages to businesses. Generally, ERP and CRM systems tend to remain siloed as their contrasting architectures make it difficult to streamline integration. Those who try to create seamless connectivity between the two often turn to custom point-to-point integration. This method is fragile, expensive, and difficult to maintain. With point-to-point connections, a developer needs to manage connectivity and implement changes. Moreover, changes impact the entire system, leaving room for errors. These point-to-point integrations deliver a short-term solution, but become overly complicated as businesses grow. With two different systems unable to communicate with one another, it becomes nearly impossible to track all customer interactions and obtain information through one interface. Sales reps spend time jumping between applications to create a 360 degree view of their customers, slowing down sales processes. As a lack of integration creates an inefficient workspace, businesses need a robust CRM and ERP integration solution in order to streamline their business processes. CirroLogix is the answer to all your cloud based IT issues.